Ahead of their show at Challenge Stadium on Tuesday, March 25, Thirty Seconds To Mars guitarist Tomo Miličević opens up to PHOEBE HURST about $30 million lawsuits, sending singles into space and why rock’n’roll is a full-time job. Say what you like about Thirty Seconds To Mars, they’re no strangers to hard work. Last year alone harboured a critically acclaimed album, globetrotting live shows, an award-winning documentary and countless meet and greets. Just a few months into 2014 and the band are already embarking on one of their most extensive world tours yet. But then Jared Leto, Shannon Leto and Tomo Miličević have never been ones to rest on their laurels (or rest at all, it seems). Starting out as a collaboration between Hollywood actor and one-time My So-Called Life heartthrob, recent Oscar-winner Jared and his brother Shannon, Thirty Seconds To Mars’ self-titled debut was released in 2002. Miličević joined the band as lead guitarist a year later and the band went on to achieve platinum sales with second album, A Beautiful Life, as well as a clutch of MTV Awards. 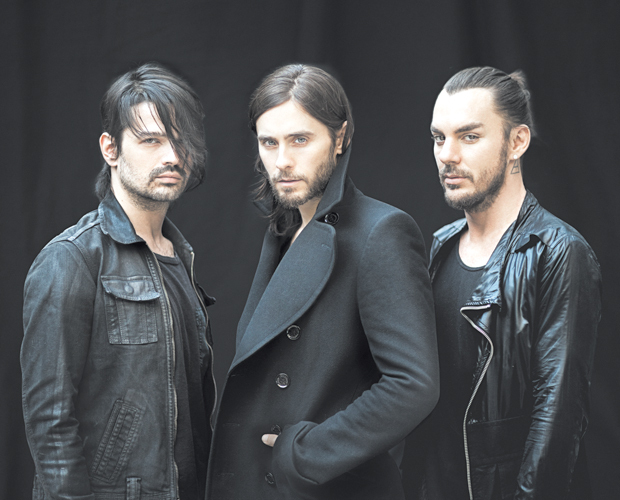 Some 11 years and two albums later, Thirty Seconds To Mars are showing no sign of slowing down. “It’s a non-stop process, whether it’s touring or making a new album, or just making videos or creating content; we all do a lot of different things,” Miličević says. “It’s a full-time job, there is no break. We may not be on tour, we may not be currently making an album, but we’re always doing something. The Australian leg of the Love, Lust, Faith And Dreams Tour comes after Thirty Seconds To Mars were forced to reschedule dates originally planned for August last year. As a band that enjoy a strong connection with their fans, it was a tough decision to make and Miličević expresses his gratitude for “everyone’s patience” during the postponement. The tour follows the band’s fourth studio album, Love, Lust, Faith And Dreams, released in May last year. A concept album with hints of electronica, it peaked at #4 in the ARIA charts, thanks in part to the unique promotion technique which saw its first single (appropriately named Up In The Air) blasted into space. It doesn’t take a clinical psychologist to figure out that recording an album without the pressure of a $30 million lawsuit makes for a much happier working environment, but while the legal complications undoubtedly took their toll on the band, they also proved to be the inspiration behind Leto’s directorial debut, Artefact. The documentary film follows Thirty Seconds To Mars’ legal battle and shines a light on the less savoury side of the music industry. It won the People’s Choice Documentary Award when it premiered at the 2012 Toronto International Film Festival.